In the coming decades, demand for electricity will increase considerably on the African continent. Investment in power generation, transmission and distribution is necessary to meet this demand. In this paper a cost-optimization tool is used to assess investment opportunities under varying scenarios of GDP growth, electricity trade and CO2 taxation. Business as usual fuel price outlooks are assumed, and related assumptions are relatively conservative. The goal is to find if there are economic indications that renewable energy might play a significant role in the expansion of the African electricity system. The results show that there is potential of renewable energy (RE) resources to have a significant share in the generation mix. By 2030, 42% and 55% of the total generation is powered by renewables in the high and low GDP scenarios respectively. Promotion of interregional trade can assist in unlocking RE potential across the continent, such as hydro in Central Africa and wind in East Africa; these regions are projected to be net exporters of electricity. Additionally, generation by off-grid technologies increases over time, reaching 12% of the total generation by 2030 in Sub-Saharan Africa. Increasing the electrification rate is one of the key goals of African energy policy (Brew-Hammond, 2010). The continent, and particularly Sub-Saharan Africa (SSA), suffers from severe lack of power infrastructure. Even though 13% of the world's population resides in SSA, only 32.5% have access to electricity (The World Bank, 2013). At the same time, a number of countries, such as Somalia, Uganda and Rwanda have electrification rates that do not exceed 5%, while in rural areas, this figure is even lower (Brew-Hammond, 2010). This hinders economic growth and prevents rise in the standard of living for these countries (Collier and Venables, 2012; Javadi et al., 2013). Lack of adequate infrastructure is threatening the smooth operation of major industries, such as mining (Visser, 2013). Despite these obstacles, economies in Africa are growing at a fast pace. According to the IEA, GDP in Africa is projected to rise at an average rate of 3.8% annually between 2010 and 2035, resulting in a doubling in electricity demand over the same period (IEA, 2012). The current state of power generation infrastructure on the continent calls for considerable investments (Eberhard et al., 2008) and, based on the IEA's New Policies Scenario, capacity additions of 261 GW would be required to meet the rising demand (IEA, 2012). However, even this increase in generating capacity will not be sufficient to bring the electrification rate to levels comparable to those of developed countries (Bazilian et al., 2012). It should be noted that another study conducted by IRENA projects a higher demand for electricity than tne IEA's World Energy Outlook. In a business as usual scenario, the former estimates that capacity additions of 250 GW will be needed to fuel industrial growth and reach an electrification rate of 43% across the continent by 2030. In its Renewable scenario, which promotes investment in renewable energy technologies and off-grid power generation, an additional 32 GW is required by the same year to ensure universal access to electricity (IRENA, 2012a). 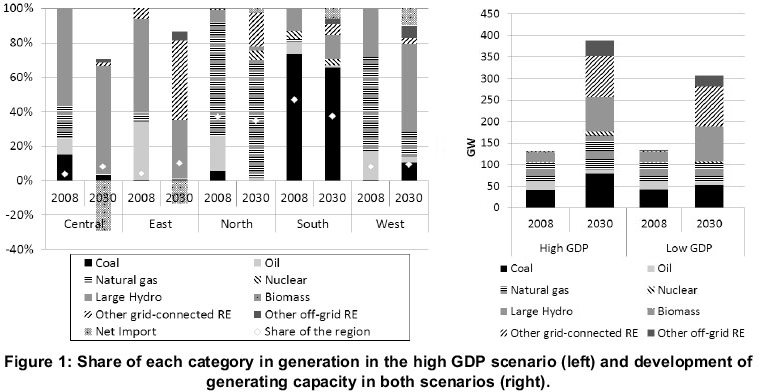 Nonetheless, as approximated in the same study, financing needs for either of these scenarios are remarkable and challenging; $2.3 trillion for the Reference and $3 trillion for the Renewable scenario, with the difference originating mainly from elevated investment costs for generation, transmission and distribution infrastructure. Experience with energy infrastructure in Africa in the past has exposed shortfalls in governance, capital and a skilled labour force, all of which can be necessary ingredients for a successful expansion of the current power system (Collier and Venables, 2012). However, the continent is endowed with extensive energy resources, which if exploited could improve the energy outlook to a considerable degree. Africa is rich in fossil fuels (U.S. Energy Information Administration (EIA), 2012), while there is great potential for low-cost electricity from hydropower and other renewable energy resources; primarily solar and wind (IRENA, 2012a; Kebede et al., 2010). In fact, unexploited hydropower potential on the continent is estimated at 220 GW installed capacity (Eberhard et al., 2011), which is comparable to the necessary capacity additions over the next two decades. Promoting large-scale projects, such as the 40 GW Grand Inga project (Showers, 2011), might provide the boost required to upgrade Africa's energy infrastructure (Bazilian et al., 2012). Further, it is argued that decentralized generation of power can help provide electricity to remote areas, while at the same time conserve power via a reduction in transmission and distribution losses (Sebitosi and Okou, 2010). Literature assessing Africa's power sector agrees that sizeable investments are called for to improve the current status. This paper presents results from scenarios of the African electricity sector in the medium term, jointly conducted by the Royal Institute of Technology and the International Renewable Energy Agency (IRENA). The objective is to provide an indicative estimate of the potential for electricity trade and investment opportunities in grid-connected and off-grid power generation projects in Africa. A special focus is given on the potential for renewable energy (RE) electricity investment. The authors do not undertake detailed project and grid integration studies necessary to determine specific potentials, nor regional disaggregation. Rather the focus is directed on an indicative cost benefit analysis. Building on this work, IRENA has developed more detailed, country-by-country regional power modelling for selected regions in Africa (Miketa and Merven, 2013a, 2013b). An analytical model has been constructed, calibrated and used to quantify future power station investment and operation scenarios. The model calculates the lowest cost expansion of the electricity system needed to meet a growing demand for electricity on the continent. This expansion is subject to various constraints. The analysis deliberately does not take into account special geopolitical constraints that may slow the expansion of trade in the future. Rather, efforts are geared towards shedding light on the potential benefits of the latter, assuming that demonstrating the techno-economic feasibility may help accelerate the policy and investment support needed. 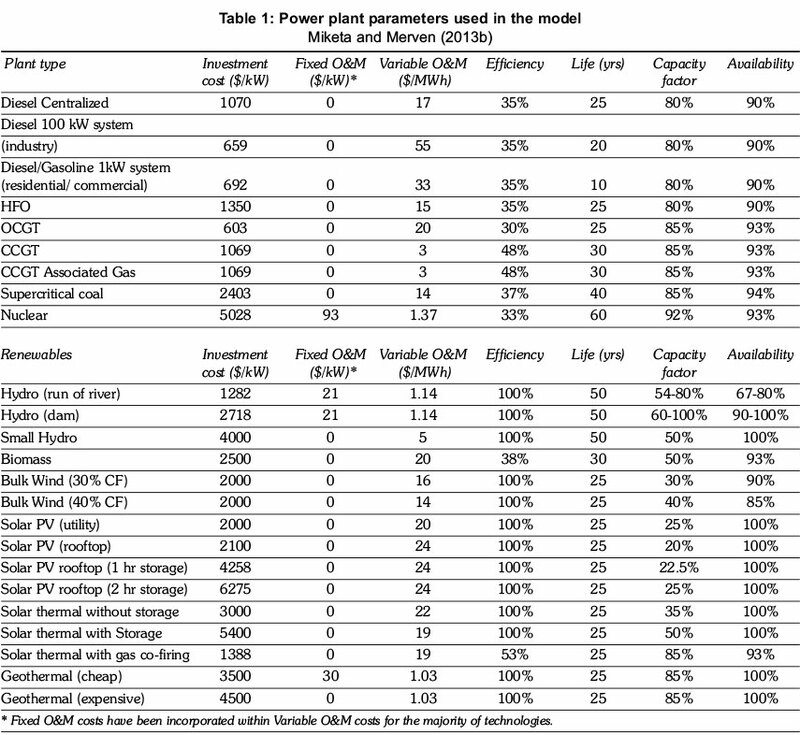 There are at least two well documented African electricity models available (Rosnes and Vennemo, 2012; Sofreco, 2011). In order to develop an economy-wide perspective of potential RE power plant investment these two models have been updated and refined with respect to: historical data, spatial definition, regional integration, time horizon, renewable and other energy resources availability, and power plant and performance data.1 The existing Rosnes & Vennemo's model is useful for capturing overall investment needs within four African regions. That model utilizes exogenously defined demands for energy services. Selected policy goals impose technical constraints and economic implica-tions.2 Sofreco (2011) approaches the analysis differently. It undertakes a demand analysis for each country, and aggregates these into regions. It then assesses the potential for investment within, and trade between, each region to meet demand growth on a least cost basis. Sofreco also undertakes a detailed analysis of fossil fuel reserve potentials. • Extending the modelling period to 2030, and increasing the temporal resolution to cover annual investments. This allows the provision of greater detail regarding generation and transmission investments between countries and regions. Furthermore, this allows closer consistency and testing of results with power pool investment strategies, as well as flexibly matching climate change trends. • Covering (currently omitted) sub-Saharan countries and associated trade. This is important as inclusion of all these countries enables the modelling of potential increases in bulk renewable energy investments, and links. We augment the model based on the KTH-dESA power pool modelling (Broad et al., 2012; IRENA, 2012a). This will comprise a 'country by country' region as well as a macro-region in the pan African model. • Modelling seasonal, daily and sub-daily representative 'time-slices' throughout the year. This is needed to include variations of demand and generation. It also allows parameters such as demand3 and availability of bulk RE resources to be characterized in those times slices, which strongly influence trade and resulting investment requirements. • Addition of the most recent estimates of renewable energy resource potential estimates (Hermann et al., 2012). • Reporting of CO2 emissions for each scenario. 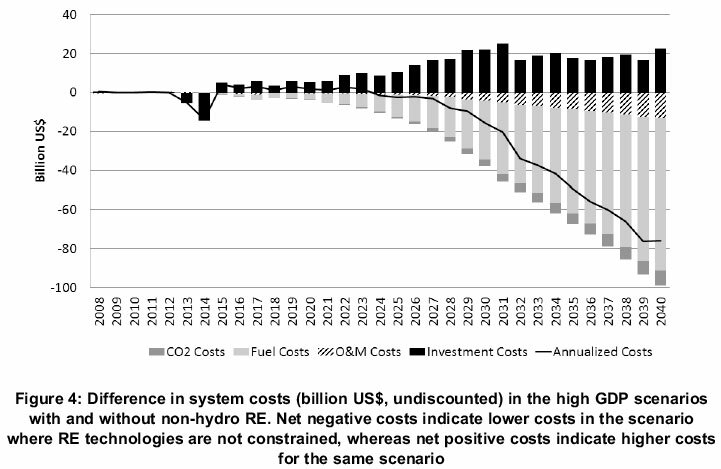 • Updated RE cost projections based on the IRENA's latest analysis (IRENA, 2013) and consistent with assumptions used in the IRENA's country-by-country power pool models (Miketa and Merven, 2013a, 2013b). The model developed for this paper is a linear cost optimization energy systems model. The analysis utilizes NPV costs. For each region over twenty generic generating technology (or configurations of specific technology) options are considered (Table 1). These include fossil, nuclear and renewable electricity generators. Renewable options are classified by other characteristics, such as by wind regimes, cost regimes, or storage potentials. Since renewable energy holds strong promise for supplying off-grid power providing access in unconnected areas, this study assumes that in 2030 up to 12% of the residential-commercial demand in South, West, East and Central Africa is met by off-grid technolo- gies. The assumption is taken from the results of the aforementioned IRENA's country-by-country studies where three decentralized generation options are explicitly modelled; rooftop photovoltaic, small hydro and small diesel generators. The electricity generation data used in the model are based on the international literature,4 and aggregate country level data5 into a five region macro representation of the African continent. The regions modelled are classified as Southern,6 Western,7 Central,8 Eastern9 and Northern 10Africa - each with different demand11 and resource profiles. Future international fossil fuel prices are based on IEA's projections (IEA, 2012). One primary aim of this exercise is to provide an indication of the potential for electricity generation from renewable energy sources. Partly due to the coarse nature of the analysis, conservative assumptions were made in regards to RE investment potentials, while the results, even though are robust, would still need to be filtered through the lens of specific project data and related analysis.12 Results for the period 2008 to 2030 are reported. The analysis is initially undertaken with the objective of meeting a growing demand for electricity at the lowest possible cost. Thus, when RE is chosen by the model there are two key implications. Firstly, this indicates that RE technologies are cost-competitive and can reduce the cost of power generation in Africa. This in turn will make access to electricity more affordable. It is assumed that as Africa develops increased fuel exports of local reserves will be readily possible. Thus, at the prices assumed, utilization of local RE resources potentially frees up fossil fuels, most notably gas for export. Effectively the cost of moving to greater renewable electricity generation is outweighed by the monetary gains to be had by selling the freed up fossil fuel. Two scenarios have been developed, based on high and low GDP projections to enable assessment of technology competitiveness at different power demand levels. High projections are based on country by country GDP projections used in the African Union's Energy Outlook 2040 (Sofreco, 2011) - average annual growth over the period exceeds 6% - while the low projections are taken from projection for Africa in the IEA's World Energy Outlook - 3.8% average annual growth. In these scenarios, trade is allowed, as is investment in all technology options. We do not consider investments in projects which aim to export electricity outside Africa, though trade within the continent is allowed.13 Such actions are likely to further increase the deployment of RE through the continent. Even without these measures, the share and absolute investment in RE increases dramatically, as shown by Figure 1. By 2030 roughly 42% and 55% of electricity generation is renewable, in the high and low GDP scenarios respectively. The significant potentials for new RE investments are to be found in all the regions modelled. In particular, large investments in RE are projected in Central, East and North Africa over the study period. In Central Africa, where according to our region split the Democratic Republic of Congo (DRC) is situated, large hydro investments are likely, as DRC is home to large hydro reserves hydro potential in the Inga project on the Congo-river. Some of this potential is invested in during the period consid- ered. Only around 13GW of over 40GW potential of the grand Inga project is assumed to be completed by 2030, limited by the maximum speed of project implementation according to analysis of project documents. In the north and east, large quantities of wind energy is generated, at very high load factors. In the East, 22GW of new wind capacity is invested in as well as 13.5GW of new hydro. Over 45GW of wind with an average load factor above 40% is estimated to be available in this region. In the north, there is investment in 36GW of wind at estimated load factors of 30 to 40%. However, due to conservative maximum penetration rates assumed in the analysis, not all of the economic potential is realized by 2030. A key issue relating to the high wind penetration will be integration in a robust and resilient manner; ensuring the balance between demand and intermittent supply. Related to this, much of the wind based generation potential is close to the coast in dry countries. These dry countries have high demands for desalinated water, which is relatively inexpensive to store. Thus, desalinated water can be produced during periods of high wind availability or during times of off-peak demand, so as to reduce electricity demand in other instances. 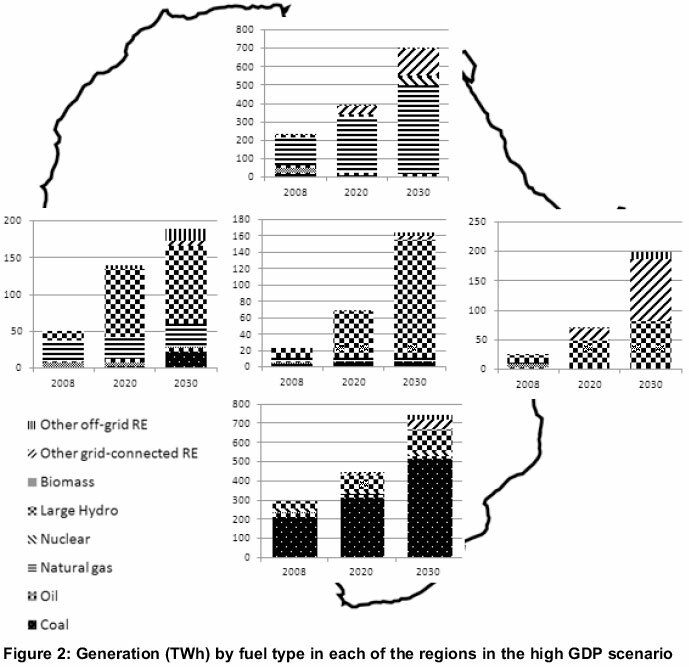 Despite the considerable increase in power generation by RE sources across the continent (Figure 2), none of the regions reach their full economic investment potential in RE in the timeframe of the scenarios investigated. In all regions, a greater rate of RE technologies deployment would be cost optimal. This does not occur, as the analysis assumes that their maximum annual penetration is limited. In the scenarios modelled, limited electricity trade is allowed between regions. In order to estimate transmission costs required for trade, an average of 365$/kW investment is required for electricity to leave a region, according to existing IRENA assessments (Miketa and Merven, 2013a). The same is required for electricity to be imported into a region. Further, different transmission losses are assumed for the interregional linkages, due to variations in distances between the regions; primarily from major points of energy source to points of energy demand. To the north, large losses of around 20% are assumed, over 'normal' intrare- gional transmission losses of 7%, for both leaving and entering a region. Small losses between West and Central Africa are assumed, especially as the DRC is already included in current West African power pool planning. The result, even with these assumptions is that trade is economically viable. Figure 3, in which each arrow is in proportion to the level of trade, indicates the role trade plays in freeing up Central African hydro potential. Significant trade potential occurs from the east, where high load factor wind is available. 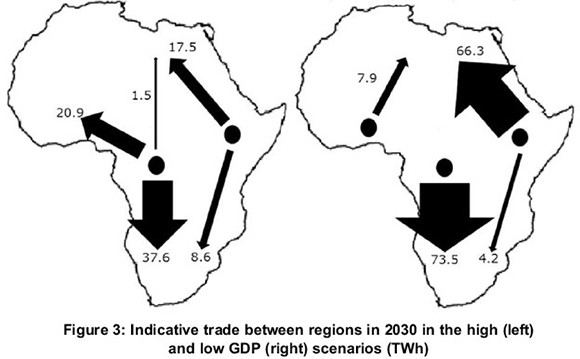 The trade of 73.5 TWh to the South from Central Africa in the low GDP scenario is the largest trade flow in 2030. It accounts to about 12% of the electricity demanded in that region. It should be noted that trade occurs at a greater scale in the low GDP scenario, as there is lower demand in RES rich regions, such as East and Central Africa, thus freeing up electricity for trade. Scenarios without non-hydro RE, without CO2 tax and without trade have been modelled within the High GDP scenario. Differences in system costs with and without non-hydro RE are shown later on in this paper. Note that when non-hydro RE development is not constrained, it is chosen as part of the optimal solution. Africa will have a more expensive electricity system without RE, and it will result in greater emissions. During 2008-2030 the total un-discounted system costs in the scenario where RE investment is limited amount to $2.874 trillion, while in the scenario where RE investment is allowed, total undiscounted system costs for the same period amount to $2.834 trillion. For years 2008-2040, the respective figures are $6.025 and $5.467 trillion. At the same time, CO2 emissions are 6.35% lower in the RE scenario for period 20082030, and 12.86% lower for period 2008-2040. It should be mentioned though that in the no RE case, large hydro is allowed to be part of the solution, while investments in other RE projects are allowed to occur only until 2015. This explains the relative similarity in CO2 emissions in these two scenarios, indicated by the small difference in CO2 costs, as shown in Figure 4 (overleaf). A lower GDP growth rate on the African continent is expected to have a corresponding effect on electricity demand. As internal demand for power remains low, the need for capacity additions subsequently follows at analogous levels. Countries with renewable energy resources at cost-competitive prices do not need to invest as much to meet their demand. Nonetheless, they still have a greater potential for electricity trade. As shown in Figure 5, the interregional trade outlook changes in the Low GDP scenario. The decrease in internal regional demand, allows low-cost power to be exported to points of greater demand. Central and East Africa export a greater share of their generated power, as a result of this. In comparison to the High GDP scenario, net exports from these two regions in this scenario increase from 68 and 31 TWh to 87 and 82 TWh respectively in 2030. Similarly, in the same year, West Africa becomes a net exporter of power, transmitting 10 TWh to Northern Africa. Moreover, in a low GDP growth case, Southern Africa's net imports in 2030 increase from 46 to 77 TWh; these figures correspond to 5 and 12% of the total generation mix of the region. Finally, Northern Africa transforms into a major purchaser of power generated in Sub-Saharan Africa; primarily from Eastern and Western Africa. Whereas in the High GDP scenario Northern Africa's net imports amount 19 TWh in 2030, in this scenario this figure increases to 75 TWh. Such a development will assist in freeing up considerable volumes of fossil fuel reserves in this region for export purposes, instead of consumption in domestic fossil-fired power plants. However, this scenario also implies that the target for universal access to electricity in Sub-Saharan Africa will be hindered to a great extent. In this section a comparison is presented between the High GDP scenario and two scenarios, in which the carbon tax and interregional electricity trade links are separately disabled in the model. This sensitivity analysis is conducted to investigate the financial viability of investments in RE technologies without these conditions. In the scenarios presented, it is assumed that a carbon tax will gradually be implemented in Northern and Southern African regions after 2014. Without this option, the grid connected renewable options are less competitive against coal power in the South, while in the North nuclear power is not implemented. Without a carbon tax, in Southern Africa, coal fuelled power accounts for about 75% of the total electricity generation by 2030, while the share of renewable technologies declines accordingly; 20% instead of 25% (Figure 6). Installed capacity of non-hydro based renewable technologies in Africa is limited to about 100 GW, instead of 123 GW projected for 2030 in the scenario with carbon tax. As mentioned, interregional trade of electricity allows cost competitive hydro options to be utilized by regions outside of where the potentials exist. Figure 7 shows how the electricity mix changes in each region with and without trade. Without trade, North, South and West regions need to meet their regional demand by expanding fossil-fuelled power plants, which reduce the share of all renewable at a continental level to 37% instead of 41%. Central Africa with vast hydro potential is the main exporter region when interregional trade is implemented. When the interregional trade is not allowed, full investment in the available hydro resources makes no economic sense, due to the low regional demand. As such, by 2030, this leads to an investment of 16.3 GW instead of 23.5 GW. Similarly, in East Africa, 13.6GW instead of 22.4 GW of wind farms are developed when trade is not allowed. 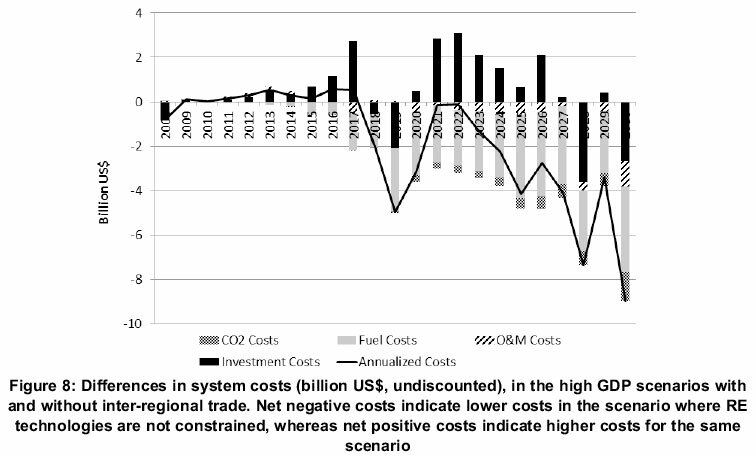 The difference in system costs between 2008 and 2030 in two scenarios with and without interregional trade is not so significant (Figure 8), amounting to 43 billion (undiscounted) which corresponds to cost savings of 1%. Since regions are not able to exploit readily available renewable energy resources beyond their boundaries, they have to use more fossil fuels, thus increasing the respective cost. The cost reduction is mainly related to the reduced fuel use. It should be noted that if we extend the assessment by 10 years up to 2040, the total system cost savings are approximately 2%. This low difference can be attributed to the high investment cost in technologies, which are only operated for a fraction of their lifetime during our projections; namely hydropower, solar and wind technologies. • Transmission costs and losses: With high levels of trade and variable intermittent generation, the coordinated development of a strong transmission system is important. The effects of varying costs and losses associated with transmission on the deployment of RE should be investigated. • The cost of fossil fuels should be varied in order to determine the relationship between international gas prices, local coal as well as oil and RE deployment by region. • The cost of key RE technologies should be investigated to determine at what price range they become cost optimal or not. This is particularly important as various costs are expected to go down with learning. The potential for demand growth in Africa is large -due both to improving economic conditions and currently large levels of unmet demand. Additionally, the continent is mineral rich thus mining, which is energy intensive, is a growing and important electrical load. If large quantities of renewable energy sources are exploited, local reserves of fossil fuels will likely be freed up for export. To incorporate large quantities of variable generation, such as wind, the development of a strong interconnected grid is important. This will help allow balancing of intermittent generation, with significant balancing potential in the hydro system, as much of the wind potential is situated in dry countries. In this regard, there exists a large and unexplored potential role for desalination using electricity. Future studies - beyond the scope of this analysis - should include, amongst others, the potential for system balancing, transmission development, smart grid investments (in the context of variable loads, such as desalination). Further - following this indicative study - an extensive parametric sensitivity and robustness analysis may be a useful complement. The goal of the latter would be to wide suite of macro factors that determine the economic robustness of these conclusions. These may include for hydro changes in water availability perhaps via climate change, or more generally the effect of rapid reductions in fossil prices with the possible onset of shale gas, etc. It would also be useful to develop a single African energy model with each national model represented. All of this is no longer a computational challenge, and it allows for a number of improvements over this work. The guidance, patience and funding of IRENA for this and related work are gratefully acknowledged. Initial efforts undertaken by the World Bank (World Bank, 2011) as well as interactions with the project leader of that effort, Vivien Foster, are appreciatively recognized. The cited work provided a cornerstone for this effort. The views and perspectives expressed in this paper are those of the authors and do not necessarily reflect the views of the IRENA and KTH or their senior management. 1. Including, for each country and region (as appropriate): electricity demand projections for each country based on GDP and population; existing power station performance data (fuels, outages, fixed and variable costs, vintage structure, all based on plant types); and data for new power stations (including costs, expected life times, and an estimation of performance improvements). 2. Further attributes of the GAMS model developed by Rosnes and Vennemo (Rosnes and Vennemo, 2012) include: Country by country model, covering the period 2005 to 2015 in one single step; considers two load blocks (off and on-peak demand) to estimate new investment requirements; the scope is limited to a detailed assessment of the electricity sector, without coverage of associated emissions and inter-linkages with water demands; extends transmission between countries and estimate trade potentials within power pools; estimates optimal power trade and plant investments (and generation) based on cost and load factor assumptions to meet national demands. 3. Across Africa electricity demand differs by: week day (weekends - with different demand requirements -occur on different days in different countries); longitude (with peaks occurring at different times in East and West); as well as latitude, with North African summer occurring during the Southern African winter. If demands are high in one region and low in another, and regions are connected, there is potential for trade and 'sharing' generation infrastructure. This will influence the trade potential as well as investment requirements. 4. Historical power plant data was taken from Platts (Platts, 2012), specific renewable power plant data, including learning expectations were taken from IRENA (IRENA, 2012b), other data based on regional power pool information or IEA (OECD and Nuclear Energy Agency, 2010). The starting point for the work was the World Bank's Electricity Spending Needs Model (World Bank, 2011). 5. Data tables by country, later aggregated by region were developed for: Fossil fuels (U.S. Energy Information Administration (EIA), 2012), hydro and geothermal (IRENA, 2012a), wind and solar (Hermann et al., 2012); Regional biomass estimates are taken from IRENA (IRENA, 2012b). 11. Each year subdivided into 24 slices - 3 seasons: captures rainfall variations by region. One season period for peak usage (winter in the South and summer in the North). Each weekday is sub divided into 5 time-slices, and each weekend day into 3. 12. Important caveats of the study include: (1) System balancing is not undertaken (this will be important especially as the intermittent wind and hydro with storage may interact in a manner that effects the investment profiles of each, as well as the level of storage required. (2) Macro data is assembled from available sources and de-rated in order to attempt to gain renewable energy potential data. In the absence of project level data, such estimates will be indicative, rather than conclusive. (3) Certain data, such as transmission costs, are purely suggestive. (4) The normal uncertainties apply, associated with scenario projections, including: technology learning rates which may vary especially with developing technologies, such as solar and nuclear; demand projections which relate to lifestyle changes, global economic conditions (especially where high growth will demand high commodity and resource extraction. The latter may strongly affect the demand for energy intensive mining, in resource rich Africa, etc.) (5) Energy trade is assumed to be relatively unconstrained by political considerations. 13. Trade is limited and allowed to grow over time. The penetration of new power plants is limited in the short term. Where project data is available, this is used. For example grand Inga is allowed into the solution in 2020. Otherwise, limited penetrations are used to approximate limited deployment rates of new build programs.